If you are new to 3D computer graphics, you’ve come to the right place to get started. Maybe you know how to use 2D editing programs, such as Photoshop or GIMP, but you want to get closer to the real world. 3DS Max from Autodesk is the perfect software to get you started with that. Offering full-featured 3D modeling, animations, and rendering solutions, this amazing software, if manipulated right, can manage complex scenes and create stunning environments, for computer games with realistic characters and award-winning film and video content. 3DS Max is a favorite among artists with such interests. This sounds pretty convincing, doesn’t it? So if you decided to enter the 3D world and create one of your own, it’s normal that you ask at first ‘Ok, but how do I start?’. This is a common problem of the newbies, they browse all the web and try to learn something in a chaotic way which usually makes them more confused or demotivates them, because it all seems ‘too complex’. We are here today to end this problem and help you learn and/or improve with this software. We collected the 6 best 3DS Max learning resources from around the web. Let’s get started! You cannot learn about something if you don’t know what it’s about. Yes, you know that 3D Studio MAX, is a modeling, animation and rendering package, but you don’t know much about its detailed features, plug-ins and the system requirements for it. And there is no better place to get you started with it but the ‘spring’ of this software, and that is the Autodesk official website. You can learn a lot about it there and get the support needed as a beginner. As you probably know already, 3DS Max is not a free package, but you are offered a free trial of it, along with the possibility of buying, upgrading and locating a reseller. There are also a short series of free tutorials in a PDF format, which you can be sure that are going to be helpful, considering their origin. Once you’ve fully documented yourself about 3DS Max you can proceed and learn more from Pxleyes, which is a website providing a few hundred tutorials. 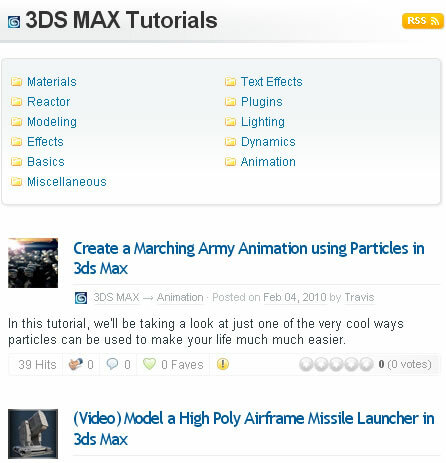 According to the preferences, you can choose to view written 3DS Max Tutorials or 3DS Max video tutorials, both high quality. The search box allows you to find fast and easy the lessons you are looking for, by typing in the tags of your interest. 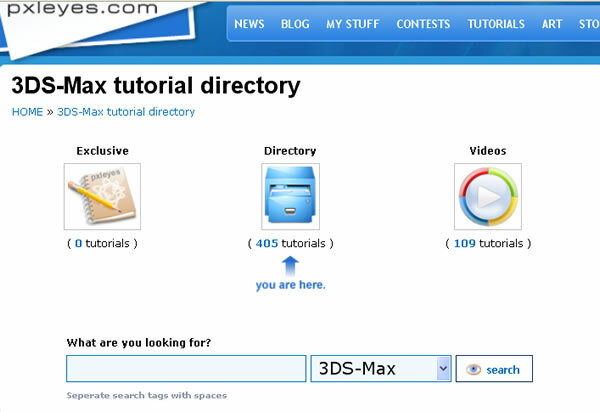 Related tutorials will also be shown once you hit enter. PXLeyes.com not only that provides a lot of great tutorials with constant updates, but also offers a source of inspiration by the contests it runs and support in the forum and in the chat room of the site. And they are all free. Here’s another website that will help you a bunch with your learning process. The tutorials found on cg.tutsplus.com are very well written, in a professional manner and the pages are highly organized and easy to follow. All tutorials have very detailed step-by-steps and it’s almost impossible not to understand the use of 3DS Max with it. There is, though, a minor disadvantage of this source. Some of the tutorials are not free, but require a full membership on the website. And also it might be difficult to find beginners tutorials, as most of them are complex projects. 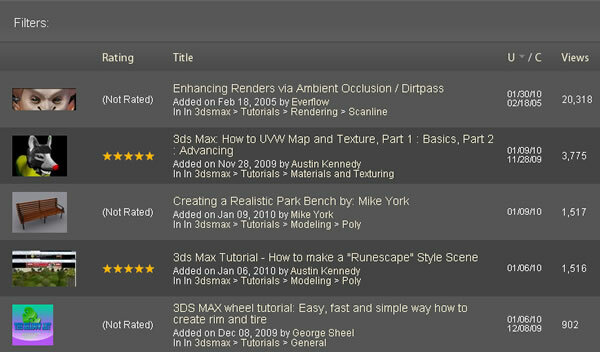 good-tutorials.com provides a lot of tutorials for a large variety of software… 3DS Max is one of them. A great advantage of this site is that it allows you to sort the tutorials by multiple criteria, such as: date, rating, clicks, comments and saves and they are all put in 8 categories: Advanced Concepts, Effects, Animation, Lighting, Basics, Materials, Characters and Modeling. The shortcoming of this website consists in the fact that there are, maybe, too many tutorials which shouldn’t be published due to low quality and the rankings are not always accurate, but this you can also decide for yourself, by looking at the numbers of steps taken, the explanations and the final result. 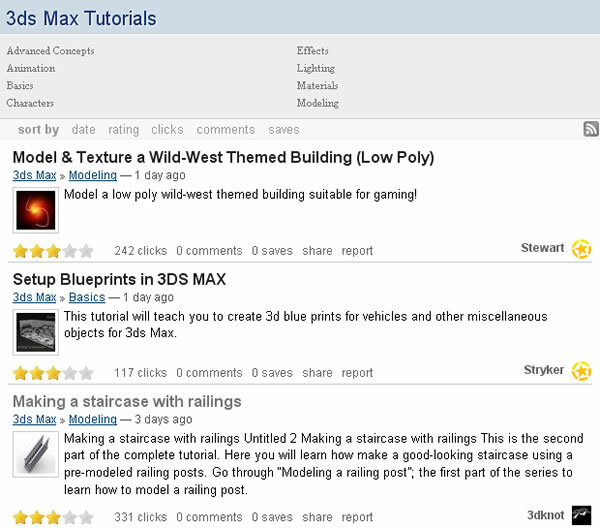 On tutorialsphere.com you can find a collection of quality tutorials from all over the web, put in 11 categories related to 3DS Max. Each tutorial supports voting without having to become a member of the site and if you decide to join ‘the crew’ you can also comment and add it to your favorites, or recommend it to someone. 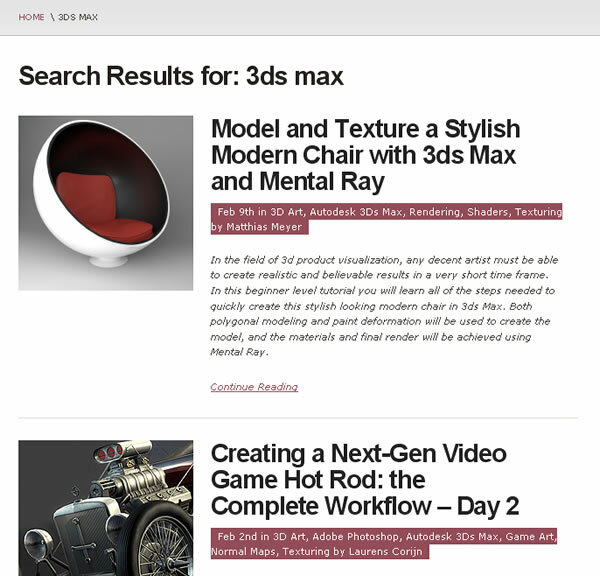 creativecrash.com also hosts a considerable number of 3DS Max tutorials and has the advantage of showing the top rated, the most viewed, a featured tutorial and the one which has the most comments. Some would find it maybe annoying that it also shows some tutorials in Asian languages. The tutorials are listed in an inversed chronological order, newest on top on the page, oldest following. This website offers different resources, the possibility to join the community in the forum and even to upload your art-work, if you become a member, of course. All in all, these were just part of the most notorious websites that provide guiding into the 3D world of computer-graphics, but of course, there are many other places around the web that you can use as a source of learning and inspiration. We just gave you a few ideas and some reference points about what we considered the best. Hopefully you find them useful and start modeling and rendering! Best of luck! Maybe you know how to use 2D editing programs, such as Photoshop or GIMP, but you want to get closer to the real world. 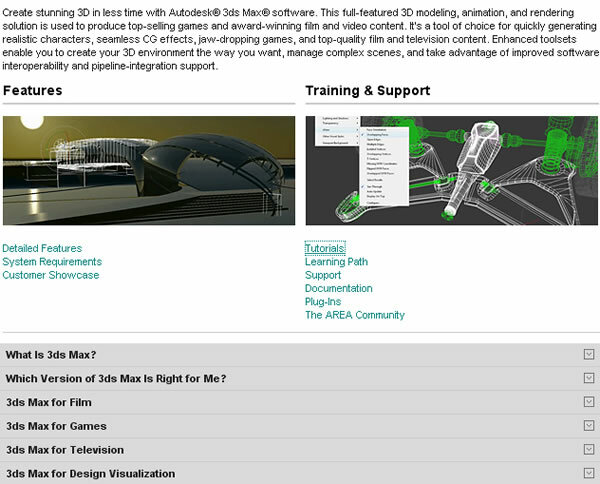 3DS Max from Autodesk is the perfect software to get you started with that….